A rope tied around a ball can be connected to one end of a light piece of line, called a messenger line, which can be thrown from a person on board to a person waiting on a pier. The other end of the messenger line is tied to your dock line. The person on the pier, once he catches or picks up the ball (called a monkeyfist) with the rope tied around it, can pull the messenger and one end of your dock line over one of the bollards on the pier. 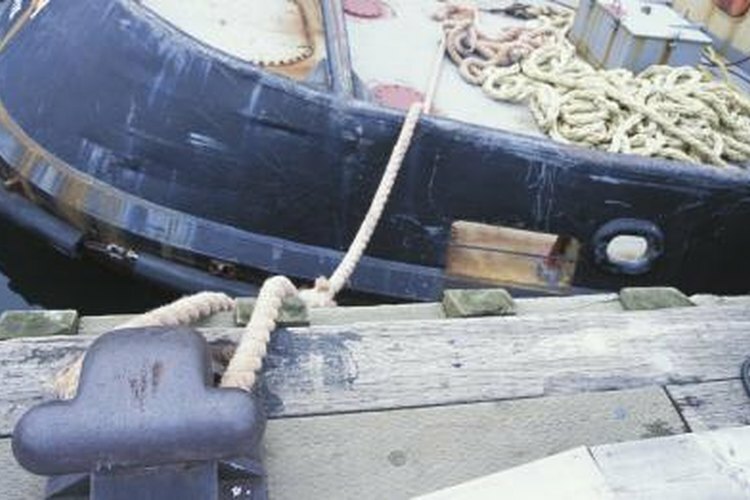 When your boat is fully docked, you can tighten your end of the dock line. Pull 3 inches of of the 3/16-inch polypropylene line over your hand; this will remain undisturbed. Make three complete wraps of the line (called the "vertical wraps") around the fingers of one hand. Pass the end of the line (called the "bitter end") through the middle of the three wraps, then make three complete turns around the center of vertical wraps, girdling them. Pass the bitter end through the middle of the knot once more and then push the bitter end through one loop of the the vertical wraps. Make three complete wraps through both loops of vertical wraps, completing the "fist." Knot the end you left undisturbed with a Figure Eight knot, and push the ball into the center of the fist. Tuck the Figure Eight knot into the fist. Pull each segment of the fist tight (which is now called a monkeyfist) and pull the bitter end, which you can then tie to the messenger line, tight. Wrap the bitter end of the polypropylene line with a bit of duct tape, to keep it from unraveling as you work it. If you lose your way while turning this, it's easier to start over than to try to fix it.